The first cross-border Jimmy Carter Work Project is held in Tijuana, Mexico, and San Diego, Calif.
Millard and Linda Fuller’s book, “The Excitement is Building,” is published. Bo and Emma Johnson, the first housing partners at Koinonia, pay off their mortgage. Event is celebrated with a ceremonial mortgage burning. The first overseas Campus Chapter is formed at the University of Technology in Lae, Papua New Guinea. Habitat’s first all-women-built house is completed in Charlotte, N.C.
Hurricane Andrew strikes south Florida — all 27 Habitat houses in the Miami, Florida, area survive. The first Native American affiliate is approved. HFHI’s Native Peoples Initiative partners with multiple tribes. The Sumter County Initiative (SCI) is launched with the goal to eliminate poverty housing in Americus and Sumter County, Ga., by the year 2000. Presidential and Vice Presidential candidates Bill Clinton and Al Gore help build a Habitat house in Atlanta, Ga. The Entebbe Initiative is approved at HFHI board meeting held in Uganda, putting more responsibility for Habitat building outside the U.S. into the hands of National Partners. HFHI completes its 20,000th house worldwide during a 20-house blitz build in Americus, Ga. The 20/20,000 Project kicked off the Sumter County Initiative (SCI). Linda and Millard Fuller receive the Harry S. Truman Public Service Award, Independence, Mo. The 1,000th U.S. affiliate — Nelson County HFH, Roseland, Va. — is approved. HFHI completes its 30,000th house worldwide with the 30/30,000 Blitz Build in Americus, Ga.
A devastating earthquake shakes Los Angeles, Calif., and floods hit Georgia — all Habitat houses in both areas survive. The first Jimmy Carter Work Project on an American Indian reservation is held in Eagle Butte, S.D. Pensacola, Fla. breaks the record for the fastest built Habitat house finishing in five hours, 57 minutes and 13 seconds. “The Theology of the Hammer,” Millard Fuller’s book outlining the biblical basis for HFHI, is published. Millard Fuller named Builder of the Year by Professional Builder magazine. Dedication of HFHI’s 40,000th house in Twin Cities area of Minneapolis, Minn.
Millard Fuller’s sixth book, “A Simple, Decent Place to Live,” published. JCWP held in Los Angeles in Watts area (21 houses in 5 days) — a number of Hollywood stars participate. Millard Fuller receives Presidential Medal of Freedom, highest civilian honor in United States presented by President William Clinton. 50,001st house is celebrated in Mexico City, as well as the 6,500th Habitat house built in Mexico. 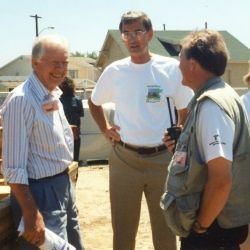 Millard Fuller inducted into the Housing Hall of Fame at National Association of Home Builders headquarters in Washington, D.C. 500 Jimmy Carter Work Project participants gather in Vác, Hungary, to build 10 houses. Habitat for Humanity begins building in its 50th nation, Romania. Judging by popular support, HFHI is ranked in the top dozen favorite charities in the U.S., according to a November article in The NonProfit Times. India’s first affiliate, HFH Khammam, celebrates its 12th anniversary and dedicates its 1,000th house. Habitat celebrates 10 years of formal partnership with students through its Campus Chapters and Youth Programs (CCYP) department. Oprah Winfrey challenges her TV viewers to “build an Oprah house” and presents HFHI’s Board Chair Wayne Walker with a check for $55,000. Two years later, the program nearly met its goal of 200 homes nationwide. HFHI’s 500th campus chapter, St. Norbert College in DePere, Wis., dedicates the 100th house built in 1998 by college and high school students. Maxwell House concludes a two-year partnership with Habitat for Humanity in which the company donated $2 million in matching funds to promote the building of 100 Habitat houses in 100 weeks with 100 Habitat affiliates in the U.S.
CCYP — 7,200 students participate in “Collegiate Challenge Spring Break” house building with HFH affiliates raising $550,000. Pensacola (FL) HFH builds three houses in one day. Nashville (TN) HFH breaks record of fastest built HFH house for the second time in U.S. — four hours, 39 minutes, eight seconds. JCWP held in Houston, Texas — 100 houses in five days. Millard Fuller named one of “100 Most Influential People in Home Building in U.S.” by Builder magazine. Millard Fuller named one of 20 Georgians who most influenced the 20th Century by the Atlanta Journal Constitution. More than 15,000 houses built this year bringing total to 80,000 houses total worldwide; 5,000 built in Guatemala alone. Jimmy Carter Work Project held in the Philippines — largest JCWP ever — 14,000 volunteers from 32 countries participating. The goal for the six sites of 293 houses in five days is accomplished. Manakau HFH, New Zealand breaks record for fastest built a house: three hours three hours, 44 minutes and 59 seconds. HFHI relocates its Latin America/Caribbean office from Americus to San Jose, Costa Rica, in an effort to decentralize and move services closer to the field.